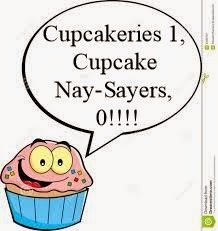 Recent Cupcake Openings, That's Right, OPENINGS!! Sometimes I feel like I'm forever posting about cupcakery closures, so I made it a point to actually search the web for recent cupcakery OPENINGS and I'm happy to report that I found almost two dozen openings as compared to less than half a dozen when I did a similar non-scientific search for closings. Yay, Cupcakes! Openings since July - look for one near you! Half Baked Gourmet Cupcakes & Coffee, Sioux Falls, SD opened August 20. 2 Sweet, Woodland Park, NJ opened in July. Iced Cupcakes (a former mobile only cupcakery), North Raleigh, NC opened August 21. The Sweet Shoppe of the South, Pigeon Forge, TN opened July 23. Sprinkles, Glendale, CA opened yet another location August 7. Sweet Arleen's, Yorba Linda, CA opened their first franchise location August 22. Little Miss Cupcape, Hyannis, MA opened in June. Royaume Sucre, Montreal, Quebec, Canada opened August 20. Minicakes by Tasha, Saratoga, CA opened August 26. Heavenly Sweets, Tampa Bay, FL opened early September. The Salted Cupcake, Schoolcraft, MI opened this summer. Lancaster Cupcake (formerly mobile only), Lancaster, PA opened a storefront August 29. Cupcake Station, Rochester, MI opened Labor Day Weekend. Cloud 9 Cupcakes, Wichita, KS opened September 12. Oh My! Cupcakes, Sioux Falls, SD adds a cupcake kiosk at Empire Mall in October. Jilly's Cupcakery, Roswell, Georgia opening in Mall of Georgia in October. Crumbs, Columbus Square, NY RE-opened in September. Sarkara Sweets, Gainesville, FL closed in September due to poor foot traffic due to bad weather. Kickass Cupcakes, Somerville, MA closed in August due to poor weekday foot traffic. Cupcake Bakehouse, London, England, closed in September due to poor foot traffic and a jump in rent.